Violence knows no boundaries. It attacks in schools, in families, and even in the workforce-places that should be regarded as safe havens. 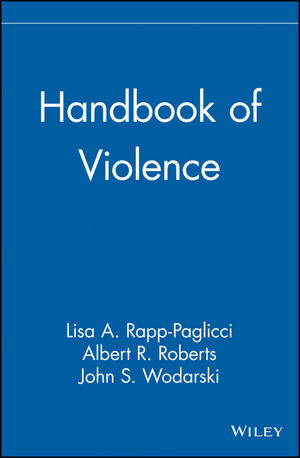 Encompassing the enormity of violence through a comprehensive, biopsychosocial perspective, Handbook of Violence examines community, school, family, and workplace violence, including identification, classification, prevention, and interview programs and case management. LISA A. RAPP-PAGLICCI, PhD, is an assistant professor at the University of Nevada, Las Vegas. ALBERT R. ROBERTS, PhD, is a professor at Rutgers University. JOHN S. WODARSKI, PhD, is a professor at the University of Tennessee and a consulting editor for John Wiley & Sons, Inc.
Violence within Families through the Life Span (A. Burgess & A. Roberts). Adolescent Dating Violence (G. Ely, et al.). Children and Adolescents from Violent Homes (L. Rapp-Paglicci). Domestic Violence in African-American Families (L. See, et al.). Domestic Violence in Latino Cultures (D. Ferrer). Children and Adolescents Exposed to Community Violence (C. Dulmus & C. Hilarski). Assessing Violent Behavior (E. Tyson, et al.). Conduct Disorder and Substance Abuse (J. Barthelemy, et al.). Girls' Delinquency and Violence: Making the Case for Gender-Responsive Programming (M. Chesney-Lind, et al.). Youth Gang Violence (R. Ellis). Youth Violence: Chronic Violent Juvenile Offenders (M. Williams, et al.). School Bullying: An Overview (G. MacNeil). Public Concern and Focus on School Violence (R. Astor, et al.). Reducing School Violence: A Social Capacity Framework (G. Bowen, et al.). School Violence among Culturally Diverse Populations (K. Jordan). Preventing Workplace Violence (J. Wodarski & C. Dulmus). Workplace Violence: Prevention and Intervention, Theory and Practice (J. Waters, et al.). Domestic Violence in the Workplace (P. Brownell & A. Roberts).